Ceramic knives have some clear advantages over steel – such as retaining a sharper edge for longer, being non-stick, non-porous and rust resistant. The trade-off is that they are difficult to sharpen and more prone to chipping and breaking. Our best ceramic knife pick has to go to the Kikusumi 3 Piece Ceramic Chef Knife Set, by a margin. The heat-treated ceramic provides some added protection against chips and breaks and the knives are attractive and look premium without an overly hefty price tag. What sets them apart is the attention to detail – the Japanese-inspired ergonomic handle is thoughtfully designed to suit left or right-handed chefs, and the company put extra effort into customer service and support. The Kikusumi set strikes the right balance between style, comfort, and affordability. When it comes to ceramic knives versus steel, opinion is divided, with most people sitting firmly in one camp or the other. If you’re trying to decide if a ceramic knife is right for you, let our guide enlighten you about the pros and cons, and walk you through our top five picks. There are other great kitchen knife options to consider as seen below. Do You Need A Ceramic Knife? Ceramic knives come in a huge variety of colors and can even have attractive designs printed along the blade and handle. They definitely look good, but do they do the job? Well, that all depends on the job you’re asking them to do. Ceramic knives are great for slicing and chopping finely – but definitely not designed for chopping through bone or frozen food, prying out an avocado pit or any kind of twisting and turning. If handled with care, ceramic kitchen knives are excellent tools for chopping vegetables or paring produce. If you’re accustomed to a metal blade with a wooden handle, it may take a bit of time to adjust to the lighter weight. These knives do the cutting for you, without the need for excessive force. You’ll need to learn to be gentle with your ceramic knife – too much force and you’ll be in the market for a new one quick-smart. Ceramic knives do excel at cutting. The material they’re made of is harder than steel. Once they’re sharp, they stay that way unless they’re damaged, the edge can stay razor sharp for around 10 times longer than a steel blade. Ceramic knives and metal knives differ in several basic ways, including the ability to hold an edge and thus the need to sharpen. Additionally, the weight of the blade and handle are quite different when moving from metal knives to ceramic. Sharpening: While metal blades will need to be sharpened over time and can be honed and sharpened at home, ceramic knives generally need to be shipped to the manufacturer, though they will hold an edge for longer than a metal blade. If you prefer not to sharpen, ceramic is the perfect choice. Sturdiness: Ceramic knives are made from compressed materials, generally zirconium oxide. This material is then polished and sharpened with a diamond sharpening tool. Zirconium oxide knives are harder than steel, which makes them more brittle and prone to chipping and snapping. 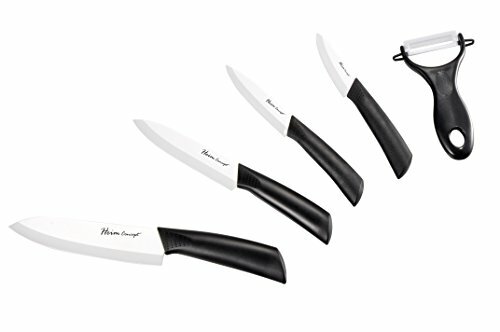 Stain and rust resistant: Unlike steel knives, ceramic knives will not rust or stain. Lightweight: This may be a pro or con, depending on your personal preference. Ceramic is super light, great for reducing strain during repeated chopping movements, but may leave you feeling like your lacking if you’re used to a hefty, weighted steel knife. Non-porous: Ceramic is far less porous than steel, so you won’t have to worry about transferring odors or flavors between different foods. This also means that dirt and bacteria have less chance of sticking to the knife blade. This entirely depends on your cooking style and personal taste. If you want a knife that will maintain a sharp cutting edge for years before it needs sharpening and are prepared to treat it a little more gently than a steel knife, then ceramic will suit your needs well. However, if you think you’ll find it annoying having to swap between a ceramic knife and a steel knife constantly during your food prep – adjusting between hard foods and soft – perhaps you’d rather stick to steel knives, which are generally more multi-purpose. 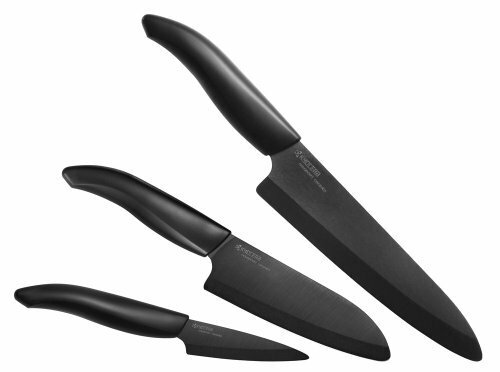 The Kyocera Revolution ceramic knife set contains a 7-inch chef’s knife, 5.5-inch santoku, and a 3-inch paring knife, which should cover the spectrum for all your chopping needs. One of the main disadvantages of ceramic knives is the fact that they are so brittle, prone to chipping and breaking. Kyocera Revolution in black go a long way towards addressing this issue. These knives are constructed of Zirconia 206; a material that Kyocera say is an advanced, high-tech ceramic which is much stronger than your average ceramic knife. 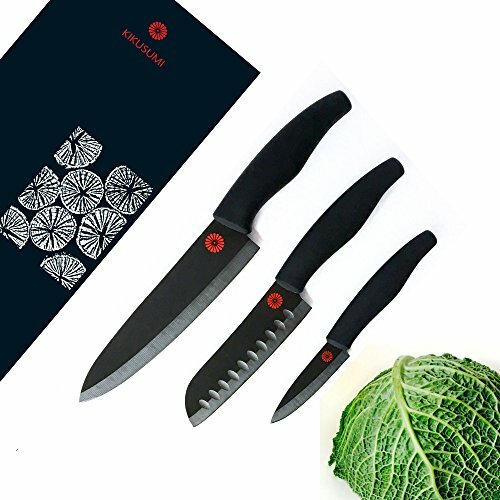 The black ceramic indicates that the knife has been through a heat-treating process that results in extra durability and a tougher blade – and also a more expensive set of knives! These knives are truly sharp and should stay that way for a long time. But when it’s time for sharpening, Kyocera offer a lifetime free service – you only have to cover the costs of shipping and handling. The sharpness, combined with the lightweight material, sees the blade slicing with ease and very little effort on your part, reducing any strain that frequent kitchen-goers may experience with heavier knives and repeated chopping. This is by far the most expensive set on our list, but you can certainly consider these top quality knives to be a fantastic investment, suited to even the most discerning chef. Unfortunately, this set doesn’t come with blade guards, whereas all the others do – a bit of a let-down, considering the cost. 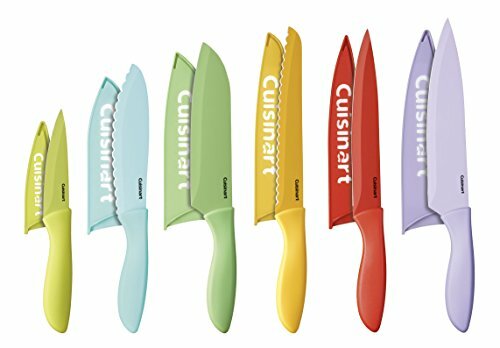 With the Cuisinart colored knife set, we see the attractive potential of ceramic in full spectrum. The multicolored knives aren’t just to add some interest to your kitchen; by color coding them for different food types, you can reduce the chance of cross-contamination. All knives come with a blade guard in matching colors. In the spirit of clarity – let’s start by saying these are not ceramic knives. They are, in fact, steel knives with a ceramic coating. In many ways, this set gives you the best of both worlds. Whereas ceramic knives are difficult to sharpen, you’ll notice that the bevel on these isn’t coated; the steel shows through allowing you to hone and sharpen them to your heart’s content. You’ll get the heft of steel with the bonus of a non-stick, non-porous, no-rust coating. The downside is they probably won’t be quite as sharp as true ceramic knives. This is where ceramic knives have an edge (excuse the pun) over steel. When you sharpen a steel knife, you’re thinning out the narrowest part of the blade – this may cause the steel to curl or roll over. As you sharpen the other side of the blade edge, this curl is removed, leaving fresh, sharp metal. Ceramic knife blades don’t curl and are both hard and non-porous. Unless the knife blade is damaged due to use on an improper surface or chipped while dropped or banged against another utensil, a ceramic blade edge should be dependable for much longer than a metal blade. The other drawback is that the coating is unlikely to remain perfect. If you hone or sharpen incorrectly, or manage to scratch the blade, the steal will show through. This set is well-suited to a starter-chef. 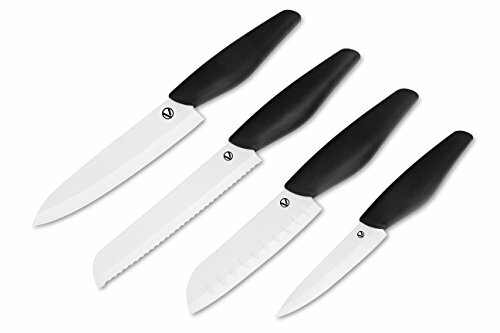 They don’t perform nearly as well as the Kyocera or Kikusumi knives we’ve reviewed, but they come at a fantastic low price and will fit the needs of the average chef. 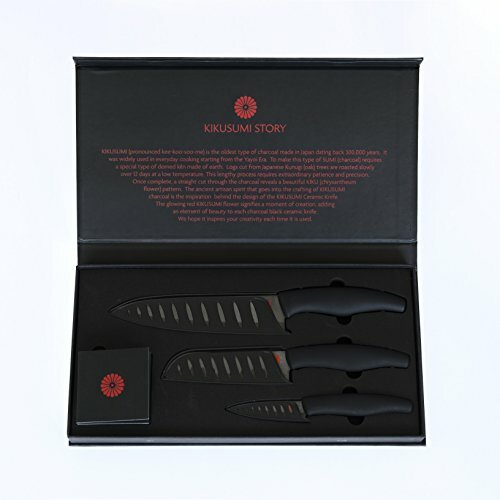 Another black ceramic set, the Kikusumi 100% ceramic knives have been fired at higher temperatures, just like the Kyocera set. Featuring a 7-inch Gyuto chef’s knife, a 5-inch Santoku and 3-inch paring knife, all have protective sheaths included. For a bit of pizazz, the Kikusumi logo is emblazoned onto the blade in bright red. Many users refer to these knives as “scary sharp” – the double beveled edge is sharpened to an acute 11-13 degree angle; you’ll be able to cut food into super thin slices with ease. Another benefit of ceramic knives is that their blades are lighter than steel, and the handles of the knives are also correspondingly lighter. Because the handles are often formed of heavy duty plastic, you’ll find that they’re often shaped to offer a much friendlier grip than heavy wooden knives. Again, work with care until you get a feel for the length of the blade, the grip of the handle and the sharpness of that blade. Kikusumi really cares about quality, they offer supreme customer service and provide recipe books, detailed user guides, and even a handy app. This set is comparable to the Kyocera set, at a lower price tag. It’s a great gift for a passionate chef and comes beautifully packaged. The VOOV Professional 100% ceramic set features a standard white ceramic blade and black handle, offering a striking contrast. This is our only reviewed set that comes with a knife block. You get four knives – a 4-inch paring knife, 5-inch santoku, 6-inch serrated knife and a 7-inch chef’s knife – all with sheaths. The block is considered to be the fifth piece of the set. VOOV haven’t skimped on quality here, either. It’s a durable, chunky, black block which has extra slots for any other knives you need to store. Made from zirconium oxide, these white blades are not heat treated, so may not be quite as tough as the black sets reviewed. One of the things we love about ceramic knives is that they aren’t going to affect the quality of your food. Steel can react with acids in food to cause browning. This won’t be an issue here. Because ceramic doesn’t stain, the white blade will stay pristine – as long as you remember to handle it with care and don’t throw it in the dishwasher where it may be damaged. Heim has put together a nice set of knives here to suit a range of kitchen tasks This Heim Concept 5-piece set has a 3-inch paring knife, 4-inch utility knife, 5-inch slicer, and 6-inch chef’s knife, as well as a peeler. All knives come with fitted sheaths to protect those brittle ceramic blades. If well cared for and used correctly, this is a handy little set. Are ceramic knives good to go in the dishwasher? This is generally not recommended. A ceramic knife is sharp enough to cause a dangerous cut for anyone emptying the dishwasher. The jets of a dishwasher can lead to knives getting banged around against other utensils, and your knife may chip. While there is no risk of oxidation such as metal knives may experience in the dishwasher, these knives are so quick and easy to clean by hand. They’re very dense and unlikely to hold onto odors from foods like onions or pungent cheeses. The handle on the Heim knives is plastic, and coated with soft rubber. It also has “gripping dots”, making it nice to handle and non-slip. Experienced chefs may not find these knives quite as sharp as some of the more premium examples here, but they are a great, affordable starter set. Ceramic knives were once considered the high-end knives of chefs. As more of them are produced and the price comes down, the color options grow more numerous. These are no longer only for the professionals in the kitchen. If you’ve got knives that you’ve worked with for years, consider adding a simple ceramic paring knife to your tool chest. With these clever kitchen utensils, you can easily slice carrots, ginger, and other produce into very thin slices for garnishes or in a salad. For cooks with wrist or arm trouble, consider switching over to ceramic knives to reduce weight and pressure on your joints.